[www.kaieteurnewsonline.com] – Believe it or not, in some parts of the country, there are children who still walk to and from school, barefooted. This is the situation occurring in Mabaruma, Region One. Following a request from the Hobodeia Primary School, Digicel Guyana Incorporated donated 100 pairs of shoes to the students. The students of Hobodeia Primary School sporting their new shoes. could get to school safely. Wills, who became headmistress of Hobodeia Primary in May 2013, in her request to the company, explained that many of the students get to school usually by using boats and by walking along the river banks, and that more often than not, they would arrive to school with cuts and bruises on their feet. 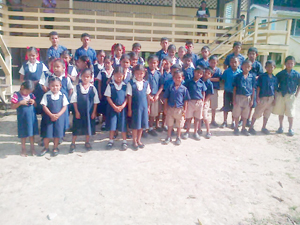 Students and teachers of the Hinterland school were extremely excited by Digicel’s visit. Sanichara said that as the boat with Digicel staffers approached the landing, it was greeted with cheerful smiles and waves. The students became even more gleeful and excited as the shoes were being unpacked for them to make their pick. The students had only one task, to choose for themselves, the perfect pair of shoes, so as to ensure that it fits them comfortably. Apart from the donation of shoes, Digicel Guyana also provided the school a quantity of books, which would be added to the institution’s library so as to serve as teaching tools. Meanwhile, following the presentation of the items, Marget Jardine, a senior village councillor who spoke on behalf of the Village Captain, thanked Digicel Guyana Incorporated for visiting the village and providing its children with some of their basic needs. To this end, Gavin Hope, Digicel’s Sponsorship Manager highlighted that his company is committed to fostering the development of Guyanese, and that education is one of the areas that are at the top of the agenda. Digicel Group Limited is one of the leading global communications providers, with operations in 31 markets in the Caribbean, Central America and Asia Pacific. After 12 years of operation, the company’s total investment stands at over US$4.5 billion worldwide.